What about modern learning, though? Discussions about bans tend to focus on the losses that people perceive: losing access to a device, to unrestrained mediated communication, to the illusion of safety. Parents are understandably anxious about children traveling to and from school alone—and about the possibility of school shootings or other emergencies. Mobile phones offer vague reassurance. Yet parents are also increasingly concerned about the amount of time their kids spend glued to screens, about their kids being cyber-bullied, and whether their kids are learning as much as they should. It’s time to redirect this conversation. Instead of putting devices and their absence on center stage, let’s look squarely at the benefits that students enjoy when distraction machines get expelled. We know more now than we did a few years ago about the influence of mobile phones on young people, learning processes, and social life. Instead, we could think seriously about how to create “safe spaces for the mind,” where students can focus on class work, learn more, reduce stressors that inhibit education, and develop social skills for success in school, work and life. While young people surely love digital devices and networks, many of them are worried about negative effects like distraction, addiction, bullying, rumor spreading, peer pressure, and lack of in-person contact. There’s ample research documenting that cellphone use distracts from productive learning. Students lose focus in class due to their or classmates’ cellphones, that phone use is correlated with bullying and being bullied; and that digital communication creates stress for young people. Research also shows that student performance improves when these devices are banished and that spending time without devices makes kids more empathetic. While young people surely love digital devices and networks, many of them are worried about negative effects like distraction, addiction, bullying, rumor spreading, peer pressure, and lack of in-person contact. Fifty-four percent of teens think they spend too much time on their phones, while a third say they lose focus in class because they’re checking their phones. (Also, fifty-one percent of teens say their parents are distracted by their phones when having in-person conversations.) Most teens have tried to reduce the time they spend using mobile devices. Phone interdictions at school could aid student self-development, in part by providing more independence from peers, parents, and technology alike. If we do “reflect on our phone use in society” and make student success the top priority, we can summon the collective will to realize the benefits of smartphone constraints. This means overcoming some logistical obstacles. Many administrators dread the chore of keeping phones out of schools, such as by providing individual lockers or forbidding students to bring phones. There are other alternatives to the status quo. For example, more than 600 public schools across the country have started to use pouches that temporarily disable phones in certain areas of a building. The practice is becoming more widespread in hospitals, churches, concerts, and courtrooms. Similar experiments in systemic device constraints abound. Phone ban proponents are sometimes characterized as Luddites, as “against technology.” Not so. Rather, this call to create safe spaces for the mind is Post-Luddite, in addressing the negative externalities of device use. It declares what we stand for: helping humans to better understand the world, to engage in dialogue, show empathy, think autonomously, and act creatively. These are some values driving the Slow Media movement, which nurtures collective visions for using media in sustainable ways. In defending young people’s right to disconnect from digital pressures, adults might even recognize that they have one, too. Featured image credit: Woman, using, typer and togetherness by rawpixel. Public Domain via Unsplash. Jennifer Rauch is Professor of Journalism and Communication Studies at Long Island University Brooklyn. 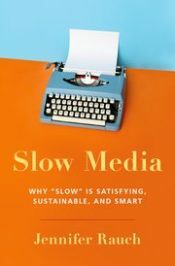 Her book, Slow Media: Why Slow is Satisfying, Sustainable and Smart, looks at how the Slow Food movement has influenced the way people produce and consume media. You can learn more at Slow Media. Great text! It shows exactly our reality regarding the (bad) use of smartphones nowadays!